Very Nice Girl is a top quality fewspot Knabstrupper mare who was Best Mare and Premium Graded by the KNN in 2010, with a 9 for her type and her walk. She is a Purebred Knabstrupper with excellent conformation and paces standing at 16hh. 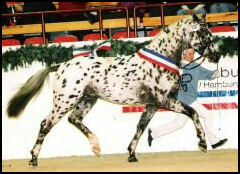 Her Sire Harlequin's Earl was Champion at his Stallion Licence and passed the 30 Day Test in Munster-Handorf. Her Dam Vhitney, a daughter of our foundation broodmare Vixen, was State Premium awarded in Germany. Very Nice Girl combines some of the best sportstype Knabstrupper bloodlines.